This is a corner unit with lots of natural light. The windows look out on some truly spectacular views. On the third floor you're able to see the mountains far off in the distance as well as the breakers coming in. 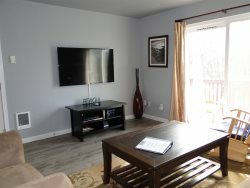 This unit does have a Smart TV in the living room and the 2nd bedroom with Roku. Love the property. We have always had good luck with any place we have stayed with you. It was easy to find the management location. The friendly staff had everything ready for us. The property is spacious and beautifully decorated. We especially enjoyed cooking in the large and well appointed kitchen. The beds were super comfortable with lots of pillow choices and soft blankets. The bathrooms are large and had everything we needed to include lots of towels. Each room has its own wall heater. We felt spoiled and would definitely stay again. Thank you!